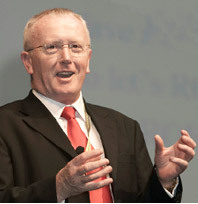 One of Ireland’s finest exports, Gerry Gannon has been a journalist, broadcaster, MC and media trainer in Australia for the last 30 years and is now one of the best known speakers and facilitators in Australia. After a decade with ABC radio in Western Australia, Gerry left to pursue a career that would bring him closer to audiences and allow him to explore parts of the world he couldn’t do from the inside of a radio studio. He established Indonesia’s first English language radio station in Bali, served on the council, and as President, of the Royal Flying Doctor Service and on the board of the Tourism Council of WA. Gerry is committed to community and non-profit organisations and has also been a board member of Access 31 Television, Kids Help Line and is a Fellow of the Australian Institute of Company Directors. A specialist conference MC, facilitator and media expert, Gerry is renowned for his wit, passion, easy-going nature and commitment to those he works with. He has worked extensively in both Australia and overseas and provides media skills training to government, not-for-profit organisations and industry entities, as well as conducting speech and presentation training courses. Gerry’s real passion is people; whether it is helping them reach their potential through training and support, MC at an event or providing valuable perspective and advice, Gerry’s easy humour and experience provides a refreshing opportunity for growth and knowledge for everyone he meets.